Lot 3A, Phase Nu 2A, Nilai Utama Enterprise Park, 71800 Nilai, Negeri Sembilan, Malaysia. 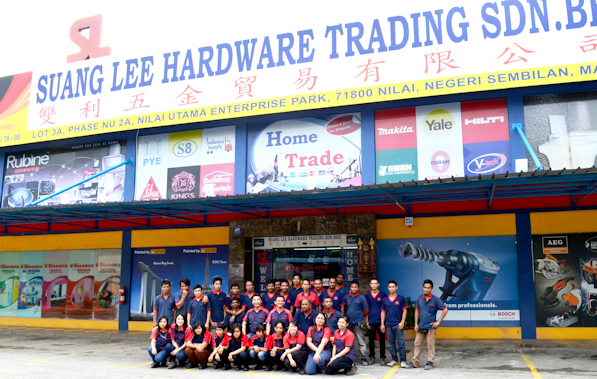 Suang Lee Hardware Trading Sdn Bhd is a Malaysian registered Company with a total paid up capital amount of RM 1,000,000,00 (Ringgit Malaysia One Million] & was established in 1995. At the beginning, we were a shop lot in Taman Semarak, Nilai. In 1997, we moved to own light industrial lot in Taman Semarak, Nilai, In 2003, we built own showroom and warehouse which is above 3.8 acres (168,000 SqFt) and located at Nilai Utama Enterprise Park. 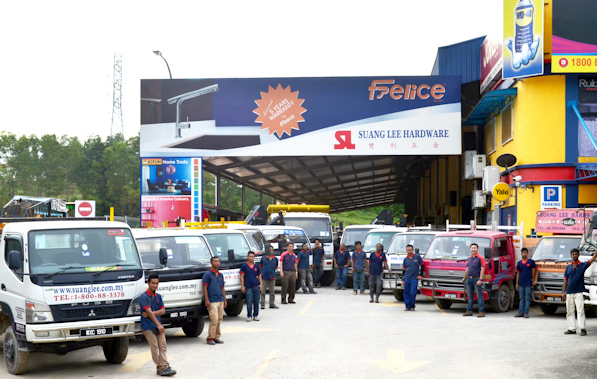 We have more than 30 workers and 10 lorries to provide value-added services to our customer where as Negeri Sembilan, Selangor and Kuala Lumpur Area. We supply more than 18,000 item likes bathroom solution, kitchen accessories, paints, safety shoes, machinery tools, power tools, fans, pneumatic fittings, pressure gauge, material handling, piping, fitting, gloves, machinery, tape, lock, adhensive, lubricant, building materials, welding equipments, safety equipments, measuring equipments, drill bits, door knobs, fasteners, castor wheels and etc. 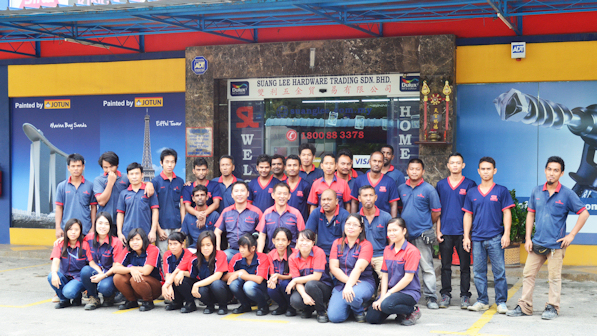 We believe that with co-operation of all Suang Lee's staff and leader partners such as Johnson Suisse, Rubine, Bluehammer, Mr. Mark, Jotun, Sissons, Seamasters and with supports from our valued customers, we are able to contribute ourselves to the company in all kind of hardware supplies.